The White Horse News is a free, fortnightly newspaper which distributes over 10,000 copies in Westbury and surrounding villages. For the last 23 years the publication has provided extensive, original coverage of numerous aspects of town life and developed a reputation for reliable news from well-informed local journalists. 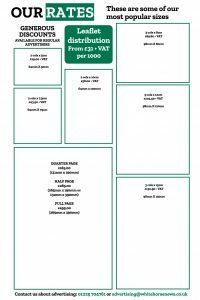 The newspaper is produced by Wiltshire Publications, a family company which is responsible for two other local newspapers: Melksham Independent News and Frome Times. If you would like to advertise in the White Horse News or on this website, please call Martyn Payne or Sarah Jarvis on 01225 704761. Click HERE for an updated list of our issue dates and copy deadlines. “Hi Ian, Just to say thanks again for our advert. Apart from word of mouth, virtually all of my new customers come from yourselves. People really do love the paper; it’s packed full of news and really well read; I think new coverage is really positive, rather than all the doom and gloom you get with most newspapers these days. “Many thanks for the advertising you did for us recently. It got our business off to a flying start. We picked up six customers off the first advert and now we are finding it difficult to cope with all the work”. 1. The publisher shall not be liable for any loss or damage occasioned by any total or partial failure (however caused) of publication or distribution of any newspaper or edition in which any advertisement is scheduled to appear. 2. Please check your ad. Whilst careful checking procedures are undertaken, we strongly advise advertisers to check their ads and regret that no responsibility will be taken for more than one wrong insertion. If you find a mistake please notify our office. 3. In the event of any error, misprint or omission in the printing of an advertisement or part of an advertisement, the publisher will either re-insert the advertisement or relevant part of the advertisement as the case may be, or make a reasonable refund or adjustment to the cost. No re-insertions, refunds or adjustments will be made where the error, misprint or omission does not materially detract from the advertisement. 4. In no circumstances shall the liability of the publisher for any error, misprint or omission exceed the amount of a full refund of the price paid to the publisher for the particular advertisement in connection with which liability arose, or the cost of a further corrective advertisement of a type and standard reasonably comparable to that in connection with which the liability arose. 5. Cancellations should be made in writing and must be received by 1pm on the Friday prior to publication. 6. Advertisements can only be accepted on the basis that the advertiser warrants that the advertisement does not contravene current legislation – in particular the Trade Descriptions Act, 1968, and the Consumer credit Act, 1974 and the Financial Services Act 1986 – and complies with the law of the European Union in force at the time in the United Kingdom. 7. The advertiser agrees to indemnify the publisher for all costs, damages or other charges as a result of legal action or threatened legal action arising from the publication of an advertisement. 8. The placing of an advertisement amounts to acceptance of these conditions.